Please welcome paranormal romance and fantasy author Helen Henderson. 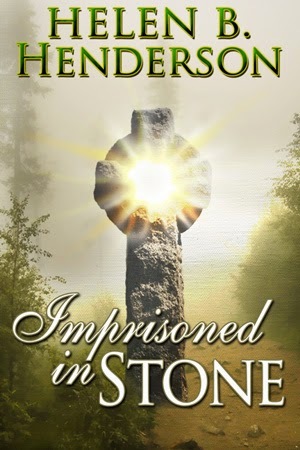 She’s here to talk about her latest release, Imprisoned in Stone. People familiar with my background know I have more than a passing familiarity with history. One thing I learned when producing historical documentaries (and later when writing local history books) was that music does more than entertain. It can set a scene and take people back to a different time and place. I brought that philosophy with me when my writing transitioned from non-fiction to fantasy. When writing Imprisoned in Stone, "Ireland's Call" by Celtic Thunder provided the baseline for duty and honor. Unlike the playlists for my other books where the period instrumentals helped me create the fantasy setting, for my latest work more contemporary pieces of music motivated the pen. One of them was the theme from Twelve O'Clock High, a television series from years gone by. The "Lonely Man Theme" by Joe Harnel was a piano solo played at the end of each episode of The Incredible Hulk. For the first time since I started writing fiction, music portrayed a character rather than an emotion or a time. The tune that accompanied David Banner as he walked down the highway to an unknown future conveyed the sense of hopelessness and loss characterized by the mage Dylan as he tried to escape from his eternal prison of stone. And took on an even more haunting aspect when he has to decide the fate of another. However, setting or the emotional reaction to music is not the only way that a tune worked its way into Imprisoned in Stone. An old sea chanty was one of the muses for a magical incantation. The first time I heard the tune was in an episode of Sea Quest. In that use, a grizzled chief got the crew singing to overcome their despair at their vessel’s damage. When I was writing Imprisoned in Stone, the music rang in my head until I wrote new words that enabled Maerva to use the magic inherent in the rhythm and tone to remove the spell cast upon her ship. If the songs or the story they've inspired sound intriguing, an excerpt and buy locations follow. For the crime of disobedience, the Brethren imprisoned Dylan’s soul in stone. After centuries, he felt the touch of another’s mind and hope for escape from his eternal prison soars. However, his potential savor is unaware of her latent magic--and her only knowledge of him comes from an eerie message on the wall and nightmarish dreams. Cuhlwch, the current head of the Brethren plans to control any and all who have magic... and will do anything to achieve his goals. Even though he is displeased with his son, Colwynn, who has healed without payment, Cuhlwch wants Colwynn to father a child, a successor to be trained in the traditions of the Brethren. And Cuhlwch means to have one, including using magic to enforce his will. Only Colwynn wants to choose his own mate--an unknown woman whose magic calls him from afar. A spell kept secret for generations. A brotherhood thirsting for power. Demands that cannot be obeyed. And in the middle of it all-- a woman who stands to lose everything. Four paths--one destiny. With the power to bind souls and control all magic in the balance. Forcing his emotions behind a wall of ice, determination fueled Colwynn’s attempt to cut the bond controlling Aine. A flick of his wrist and the chains shattered into pieces. The motes floated throughout the room in a black haze. He searched Aine’s face for signs of pain or fear. All he saw was the peaceful sleep of an innocent mind. His mind worked out the next move as if he played a game of castle and siege. He allowed his racing pulse to slow. Calm, deliberate calculations had to dominate his thoughts. Each incantation he called forth built on the one before. His voice grew louder as he fed more of his power into his words. A glow of sea sprites replaced the last vestige of the setting sun. Hundreds of the tiny winged creatures flew around the room creating long streamers that swirled and danced in the air. Gathering the living ribbons of light, Colwynn wove them into a glittering crown that he slid over Aine’s blonde curls. After a moment’s respite, he started the protection against any future geas. Although he intended his words to ring out with strength, they sounded barely above a whisper. Remove the geas from this innocent’s soul. Restore the free will that was stole. Not obstructed by man, magic, or tide. His spell echoed with the hum of fluttering wings. After a moment’s respite, he cried out, “Sprites of the clouds, assist me.” Summoning power from deep in his being and merging it with that of the eldritch spirits, he created a stronger block than he had believed possible. The glow flowed over the sleeping woman until a golden light encased her entire body. Still, the sprites’ song rose in volume. At the crescendo, a flare from the bed blinded Colwynn. His vision cleared to show a faint sparkling beneath Aine’s skin. Aine is guarded from the threat of magic, neither her father nor mine will ever force her to act against her wishes. Now to defend her from the threat of man. Thoughts swirled in Colwynn’s mind as strategies appeared to be speared and dismissed. When the night was over, he would leave. A man of Jarlath’s wealth and seniority could not be accused without proof. Once again, Colwynn dug into his reserves of energy. His hands traced the ancient runes of truth in the air. Despite the softness of the command, it contained an unyielding force. The mist of the broken control spell formed into a frame. A face appeared in the shimmering surface of the enchanted mirror. As Colwynn expected, Jarlath’s face was in the center. Then Nemor’s and several other men Colwynn knew were acolytes of the Brethren. Bearded or clean-shaved, some bald, others sporting long curls, image after image appeared until the frame bulged. An unreasoning fury surged forward. All the Brethren participated. They all knew! “Show me the man behind the plot,” Colwynn yelled. The hovering reflection wavered. When it stopped moving, one final face appeared. About Helen: Helen Henderson has written fiction as long as she could remember. Her heritage reflects the contrasts of her Gemini sign. She is a descendent of a coal-miner's daughter and an aviation flight engineer. This dichotomy shows in her writing which crosses genres from historical adventures and westerns to science fiction and fantasy. A published author, feature-story writer and correspondent, her non-fiction works include diverse topics including antiques, military history, and bicycling the mid-Atlantic region. Although she hasn’t based any fiction on the stories in her local history books, Around Matawan and Aberdeen, and Of Town and Field: Matawan and Aberdeen, the background provides a unique base for world-building. In the realm of fantasy, she is the author of two series: Windmaster and the Dragshi Chronicles. Henderson describes herself as a tour guide to the stars and worlds of imagination and invites you to journey with her. The trip begins at helenhenderson-author.webs.com.